Iceland has seen a massive surge of tourists the last years, with the south coast and the famous Golden Circle being crowded with tourists most days of the year. But not far from Reykjavík is another area that is well worth the visit. We’re talking about the Snæfellsnes peninsula. The most famous landmark on the peninsula is undoubtably the Snæfellsjökull glacier. It really doesn’t matter where you are on the peninsula, you can always see the glacier. It’s like it’s just five minutes away and you can almost touch it. The glacier is famous due to the role it plays in the 1864 novel Journey to the Center of the Earth by Jules Verne, where the protagonist finds the entrance to a passage leading to the center of the earth on the glacier. That’s why many Icelanders joke about venturing to the center of the earth when visiting Snæfellsnes peninsula. It’s hard not to gaze at the glacier where ever you go on the peninsula. The glacier also gained world wide attention in 1993 when people thought aliens would land their space ship there on the 5th of November at 9.07 PM. That did not happen, which is a shame. That would’ve made one hell of a story! But back to the Snæfellsnes peninsula. There are so many places to see there that will blow your mind, and we’ve picked our favorite ones. I could stay for days at Arnarstapi. The population of this town is not big, but it used to be in the olden days when it was an important trading post. Now, it is one of the most photographed towns on the peninsula, offering dramatic landscapes by the sea. There’s also a rock sculpture of Bárður Snæfellsás by Ragnar Kjartansson on the beach. It’s massive and you can see it when you drive into the town. The story behind Bárður is a remarkable one and is part of the Icelandic Sagas. His mother was a tall and beautiful woman and his father was a half-troll. Bárður grew up in Norway and later emigrated to Iceland with his family, fleeing the tyranny of king Harald of Norway. Bárður later lost his mind and vanished into the Snæfellsjökull glacier. Spooky, right? 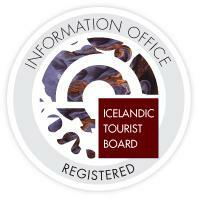 Click here to book a guided tour of the Snæfellsnes peninsula. Hellnar is the closest town to Arnarstapi, and you can actually hike from town to town if you like an easy, outdoorsy activity. You will be blown away by the walk along the seaside at Hellnar but I beg you to ask the staff at the café for directions to Maríulind. It’s a bit of a walk, around 10-15 minutes, but it will lead you to a lovely little spring of holy water. It’s dedicated to the Holy Virgin because it is said she appeared there once. Make sure to take three sips of the water and then make a wish. We cannot guarantee that the wish will come true but we can assure you that Maríulind is a beautiful, somewhat mysterious place, with a glorious view of the Snæfellsjökull glacier. Lóndrangar is an epic location on the peninsula. What a view! This pair of rock pinnacles is nothing short of majestic. They are 75 and 61 meters tall, rising above the ocean on the southern coast of the peninsula, not far from Arnarstapi. the pinnacles are remnants from a bigger crater which has mostly eroded away and are truly a sight you have to see. We could spend a day just looking at this amazing natural wonder and it doesn’t hurt that there’s a rich bird life in the rocks. You can even spot puffins there! These two places are side by side so if you visit one, you have to visit the other. That is, if you want to be amazed by nature! Dritvík is a really beautiful place, a bay enclosed by rocks and cliffs. Remains of the trawler Epine are scattered on the beach of Djúpalónssandur, which was wrecked east of Dritvík on the night of the 13th of March 1948. Five of the 19 on board were saved. On the shore are also four rocks of different sizes, so-called Lifting stones. The sailors who rowed from Dritvík in the past tested their strength by lifting the stones. There’s Amlóði (23 kg), Hálfdrættingur (54 kg), Hálfsterkur (100 kg) and Fullsterkur (154 kg). I dare you to try them all! Kirkjufell is such an iconic landmark. Perfection. Talk about being one with nature. This list wouldn’t be complete without mentioning Kirkjufell mountain. It’s a real must see, especially if you are fans of Game of Thrones. The mountain plays a key part in the penultimate series, being the mountain that leads Jon Snow and his companions to the army of the dead. By the mountain is a lovely, little waterfall called Kirkjufellsfoss, which is also well worth the visit. Kirkjufell stands by Grundarfjörður town, a beautiful place to rest your weary bones after a long day exploring the peninsula. Click here to read more about Game of Thrones locations in Iceland. I hope you have a great time on the Snæfellsnes peninsula and don’t hesitate to send me some questions if you have any! Don’t hesitate – visit the peninsula!